I buy homes, fix them up and sell them. When I was first looking to by a home in Gainesville FL, I noticed that there were cracks in the exterior block on the carport that had been turned into an enclosed room. On the inside of the house I also noticed that there were cracks in the slab which was attributing to the foundation issues. Before I went any further I got some quotes to see if this was an investment that would be worth making. After speaking with Rick at Solid Foundations he provided me with the lowest priced quote and was able to get the work done fast. Because of him and his crew we were able to get this addition fixed up adding a bath room and a closet, turning it into the Master bedroom, adding a lot of value to the house. The staff at solid foundations was not only friendly and knowledgeable but they were helpful and willing to walk me through the process as it was happening. On a scale from 1 to 10 Solid Foundations performance is easily a 10 based on their work performance, attitude, and sticking to there schedule. They also encountered several issues with the property and were able to handle those issues while still honoring their original price. My property has approximately 75ft of sea wall on it. At least 60ft of that was in dire need of some serious erosion control. I was on the verge of loosing my entire sea wall. After researching, I had three foundation repair companies come out to my house and give an estimate. Solid Foundations had the shortest wait time and was on the project within a week. They also came in with the lowest bid which saved me thousands compared to the other two companies. 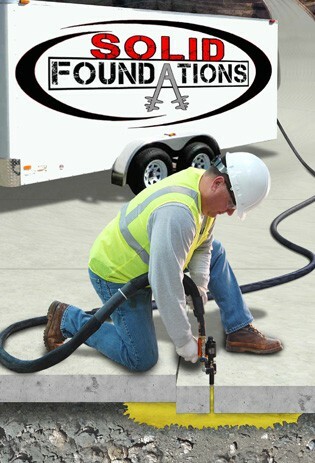 I will defiantly recommend this company to both of my neighbors Thank you so much to everyone @ Solid Foundations. Everyone was friendly and personable. They knew their job and did it. On Time! Thank You! Judy, Solid Foundation is a rock solid company that I would give ten stars if I could. Due to a large oak tree being taken down, my home was "sinking" and water was seeping in. I was at my wit's end not knowing who to turn to or what to do. i couldn't even get other companies to return my calls. Not knowing where to turn, a neighbor recommended Solid Foundation. Jimbo Willis, from the Lake City team, promptly contacted me and arrived at my home as promised. He explained precisely and in detail what needed to be done with a level of knowledge and expertise that completely put my mind at ease. He gave me a very fair price for the immense amount of work required. More importantly, he and his team did exactly what they said they were going to do, exactly when they said they were going to do it. Special kudos to Jimbo's crew, Dustin, Stephen and Mark, who worked at my home. They were neatly dressed, very polite, and extremely hard working with no sign of loud music or bad language. They made sure everything was in tip-top shape, even tightening a loose hand rail, which was completely outside their scope of work. In this day and age where many companies' priorities seem to be doing less for more, doing business with a stand out company like Solid Foundations whose priority is truly the customer is surely a blessing! I hired Solid Foundations to repair my seawall! They went out of their way to make sure I was 100% satisfied… I was told over and over by the men doing the work, and their foremen, to let them know if I had any concerns so they could make sure to deal with them. They kept all the promises they made before I hired them and then some. I have a corner lot, so my seawall is very long and I am responsible for some of the seawall that looks like it is on public property. When I explained this to Solid Foundations, they repaired passed my property line on both sides of my property to make sure my entire seawall was repaired. I don’t believe when they bid on the job they realized how much seawall I was responsible for. Not only did they repair the extra seawall on both sides, but they did not try to charge me any extra. I have already recommend Solid Foundations to my friends, and will continue to do so!